Featuring a Lifetime Guarantee, DEFIANT<sup></sup> meets or exceeds ANSI Grade 3 Standards for residential use. This lock features a drive in latch with an adjustable backseat and optional radius cut faceplate . The Powder coated finish will provide years of durability. When used as a replacement lock only a screwdriver is need to make installation a snap. The Elan Light Commercial non-locking knob in Satin Chrome is ideal for rooms where locking is not needed. Designed to provide reliable service in commercial environments, where basic security needs or specific codes are required. 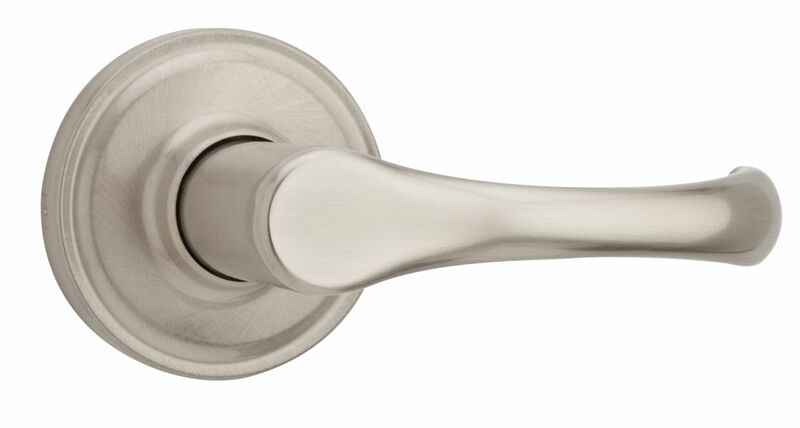 Aspen Satin Nickel Passage Lever Welcome Home Series handle sets are the perfect addition to your front door to create a unique and fashionable entryway to your home. Each is stylishly designed to provide maximum-security protection. There are many styles, finishes and configurations from which to choose. The straight styling of the Aspen lever creates an elegant, contemporary feel This passage knob/lever is best used in interior hall and closet applications where no locking is required. The knob/lever is reversible and mounts on both left and right handed doors. The crisp, clean appearance of the Satin Nickel finish adds to the overall look of the product and brings a modern feel.